What goes better next to your outdoor kitchen than a relaxing hot tub or Jacuzzi? When it comes to luxury outdoor living, a hot tub in Scottsdale is a given. Imagine one placed within arms reach of your outdoor bar. There is nothing like enjoying a chilled beverage while soaking your muscles in hot bubbling water. There are plenty of late evenings in Scottsdale with a chill in the air, just asking for a hot soak after a long day. Adding a hot tub to your backyard landscape design can easily make for your new favorite way to relax and de-stress. Not only that, there are also a slew of health benefits to soaking in a hot tub. Everyone is familiar with the idea that stress eats away at a person's health. Those high levels of cortisol have been linked to just about every catastrophic diagnosis out there. Finding ways to manage stress can seem difficult in a fast-paced world. The CDC includes "Give yourself a break if you feel stressed out—for example, treat yourself to a therapeutic massage" as a suggestion for a self-care tip that decreases stress. But what if you don't have time for a massage? Having a hot tub in your Scottsdale yard has similar effects,—and you don't have to go anywhere to get them. A hot tub or Jacuzzi is a form of hydro massage. A hot tub has many heath benefits. Improves Circulation - The heat and swirling of the water causes blood vessels to dilate which improves circulation. Decreases Arthritis Pain - This increase in the circulation eases joint stiffness and pain by bringing blood and oxygen to the joints sites. Increases Relaxation Response - Mental relaxation is induced with the warm, soothing environment of a hot tub. That brings down tension and levels of cortisol. Insomnia - This relaxation response can go a long way in aiding natural sleeping patterns if a nice hot tub soak is taken before bedtime. Hot tubs have so much to offer and they can easily be customized to fit into your landscaping theme. Add in a little outdoor mood lighting, the soothing effects of a water feature, and maybe a pool to cool off in, and you have a recipe for real outdoor luxury living! In fact, your entire outdoor space can be designed to reduce stress. If you have questions about how a hot tub can be customized to fit your landscaping, talk to one of our landscape contractors today. 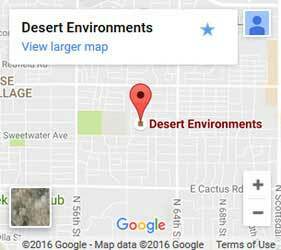 Contact us at Desert Environments for your free estimate.